Cowboy hats are undeniably romantic. They are one of the few remaining symbols of the open range, the Wild West—the topper for the iconic silhouette of a cowboy riding toward the horizon in the last glimmers of the Central Oregon daylight. 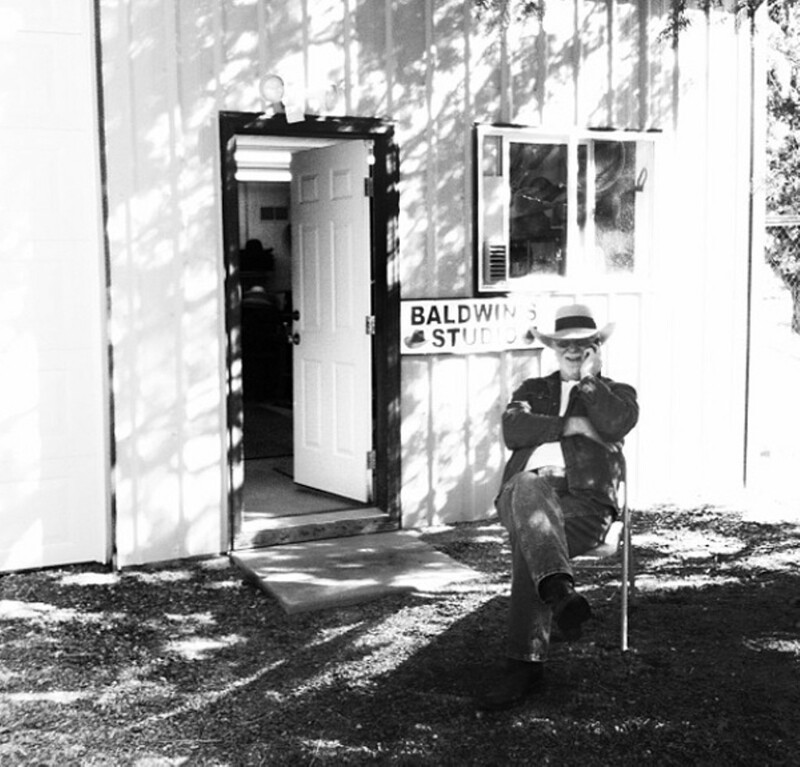 Today, for rural Oregonians, unreliable Wi-Fi connection is likely to be more of a concern than cattle rustlers or keeping the sun off the neck, but that's not stopping Gene Baldwin. "A Baldwin's Custom hat will fit like you were born with it," proclaims the marquee on Baldwin's Custom Hat and Boot Company webpage. That Baldwin has an Internet presence at all is ironic because of the classic nature of the company's work. At his workshop just north of Sisters, Gene Baldwin, the one and only hat maker for the company, uses vintage equipment from the 1890s—a sizing machine that looks like a medieval torture device, wooden molding blocks with unformed hats tied tightly to their round shells, a marble plating machine to bend and flatten brims—carrying on a craft that hasn't modernized since the second industrial revolution. "Custom means to me that we make a hat for one head, and one head only," explains Baldwin, who has been hand-crafting hats full time since 2003. As antiquated as his techniques, Baldwin's fashions aren't only from the distant past. He shows me a photograph of a Charlie and the Chocolate Factory hat, and a Django Unchained hat replica. His studio walls are covered with printed emails and attached photographs from happy customers beaming in bolos, wide brim cowboy hats and top hats. "Alaska, Wyoming, Ireland, Madagascar, Belgium, Siberia, California," identifies Baldwin as he points and shares the detailed stories of each hat. Most modern of all, Baldwin has taken on an apprentice, 23-year-old Cate Havstad, and is teaching the young hat-enthusiast the tricks of the trade. Havstad's interest stemmed from the gift of a perfect hat from a friend. "I loved it and my dog chewed it up," she says with a glimmer in her eye. "I wanted to fix it and that spurred me finding Gene. He said, 'Come on over and watch me do this.' "
As Baldwin walks me through the process of shaping, cutting and sanding, he turns to Havstad and asks, "What's next," offering an impromptu pop quiz. "Then you could put a sweatband in," she chimes with a smile. "One way to tell the quality of the hat is the sweatband. Cowboys prefer sheepskin," she proclaims—which is, of course, what Baldwin uses. "I really like learning from Gene because I like the way he does things with the older equipment. It's very meticulous and all by hand," says Havstad. "He's patient with his process, nothing is rushed. When you work with a material like felt it can be fickle and you have to be patient. It's a puzzle you have to figure out how to solve." Spending the afternoon with Baldwin is a live-action history lesson. He explains that before WWII Stetson sold three million hats a year, but that since 1970, the business has been housed in an out-of-the-way warehouse in Arlington, Texas. "What was a Stetson back in the day, is now not a real Stetson," adds Havstad, echoing Baldwin's lessons. Baldwin tells me about the brims of the vaquero tribute hats and the "Tom Horn" style hat ("Hung on his birthday in 1901," he says didactically). He shows me a book that has the head shapes of Lincoln (pretty normal looking), president Roosevelt (chunky and bulgy) and Grover Cleveland (symmetrical, but oblong). "It might be the same circumference as somebody else's head, but the shape is totally different," pipes Havstad, sitting patiently through Baldwin's backstories in her own non-custom red-felt cowboy hat that her teacher condemns because it leaves a red mark across her forehead. With every story, I am more convinced that Baldwin is the ultimate authority on hats of all kinds. And knowing how to make hats is a trade that Baldwin isn't going to let die. However, learning the craft is his way or the highway. "It is so important to pass this on, but also maintain quality," says Baldwin, looking sideways at Havstad from under the brim of his own light grey cowboy hat with one side turned up above the other like an asymmetrical mountain range. 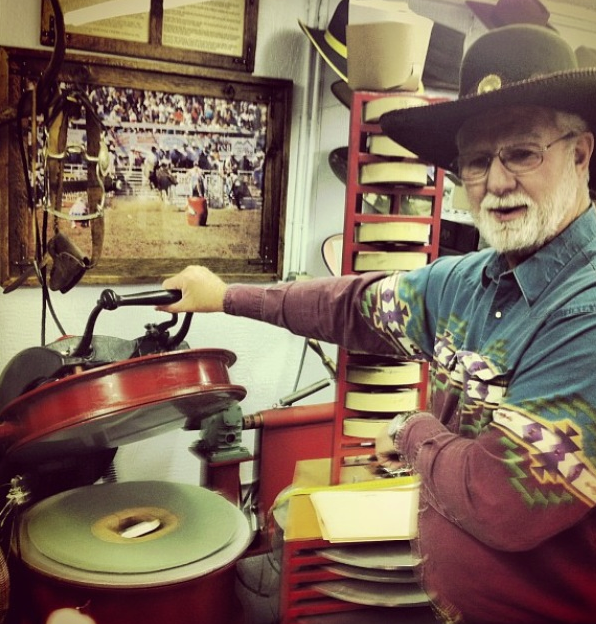 "A custom boot maker I know in Prescott, Ariz. just told me he's getting an apprentice and he said, 'whatever he knows, he's going to have to forget and do my way.'" Baldwin tends to agree with that philosophy.